Tillie Walden’s Spinning was one of the first graphic novels I read and I ADORED it. So when I heard she had another book coming out, I knew I needed to read it! And somehow, I loved this one even more. On a Sunbeam is set in outer space. Mia is the main character who joins a team of people that rebuilds structures on different planets. We follow Mia as she gets to know her new crew, but we also see flashbacks from when Mia was in boarding school where she fell in love. Of course she never stopped thinking about her first love and wants to find her again. The story is beautiful and Tillie’s artwork is fantastic. It has so much feeling and completely pulls you in. 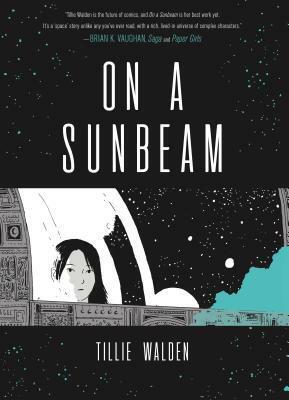 I’m partial to science fiction and stories set in space anyway, but add Tillie Walden’s gorgeous artwork and I’m in heaven. If you’re also a graphic novel fan, pick this one up. And if you’ve never read a graphic novel, this is a perfect way to start! Thank you to First Second and NetGalley for sending me this gorgeous ARC! Synopsis: An epic graphic novel about a girl who travels to the ends of the universe to find a long lost love, from acclaimed author Tillie Walden.